The very pleasant, cheerful bureaucrat who helped me fill in all the blanks in my retirement paperwork this morning shook my hand when we were done and said, "Retirement is such a different thing today than it used to be. You have a whole new life ahead. I wish you the best." 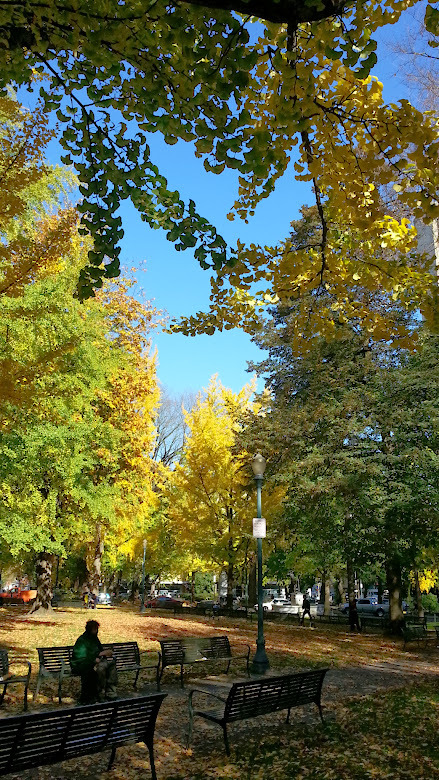 I walked back to the bus stop in the October morning, looking at the perfect sky and the yellow trees, thinking, "I want to remember this day." It was a big occasion. I felt like celebrating, but it was 10:00 on a Monday morning and I had to catch a bus back in from the suburbs and go to work. So I texted a couple of "Woo hoo"s to people, then rode downtown and got myself a four-shot mocha. Then I went to work. How nice that the person who processed your forms not only helped you but appreciated how important the occasion was and helped you celebrate it! It looks a perfect autumn or fall day - even the weather was co-operating. It was a nice touch by the Universe, giving me the most cheerful, upbeat retirement consultant in the organization! And it's fortuitous that this has been the most perfect, gorgeous October I can remember. I think I'd have felt very good even if it had been raining, but I wouldn't have enjoyed the good feeling quite so much. I like that you stopped and thought, "I want to remember this day." That's really only worked for me once, but it was a day so *perfect* it was magical. I think if we can claim one or two such days in a lifetime, we're doing pretty well. Hurrah! Enjoy the countdown as well as the post-retirement era! Thank you. It's shaping up to be the oddest feeling-state I've ever been in. As Wesley Crusher famously said, "I feel good, but also strange."